After two days spent around Husavik and the Myvatn area, we decided to check out the northern part of Vatnajökull National Park, Jökulsárgljúfur canyon. This is a stunning beautiful area, and we ended up seeing some excellent basalt formations, some raging rivers, and several waterfalls before hitting the real showpiece, Dettifoss falls. It was a full day of driving, exploring, and hiking. After Dettifoss, however, we need to get to Egilsstaðir by dinner. But having spent most of the day hiking, we were more than a little hungry, so shortly after getting back to Iceland’s Ring Road, we decided to take a ~15 mile detour to Möðrudalur for a snack. Möðrudalur is one of the highest altitude settlements in Iceland, located on the plains north of Vatnajokull. It’s pretty remote (although it used to be on the Ring Road before they rerouted it, and it’s still a bus refreshment stop). Möðrudalur is also home to Fjalladýrð, a the highest farm in Iceland. The farm also runs a gas station. And a campground. And a guest house. And even a restaurant. With waffles. It’s actually a really pleasant place to stop. A nice sod-covered farm house, you walk into a nice wooden reception and dining area that serves as both the guest-house check-in, and the food service counter. Although they’ve got a full dinner menu (if you reserve in advance for dinner! ), they’ve got a nice assortment of hot drinks and various pastry treats to reconstitute you after a long day of hiking. We settled on coffee, and both an Astarpungur (“Love ball”, a round donut-like pastry), and a waffle with whipped cream and rhubarb jam. Starting with the Astarpungur, this was a pleasant, crisp little treat. Basically a larger version of a filled donut hole, this was crisp on the outside, and fluffy on the inside. 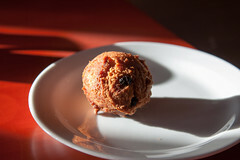 If I wasn’t trying to watch both my wallet and waistline, I would have easily had a half dozen of these. 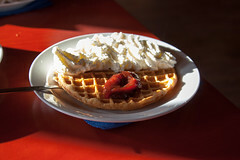 The waffle was made fresh to order, and served up with a veritable mountain of fresh, real, rich whipped cream, and a substantial dollop of rhubarb jam. We saw a lot of rhubarb jam on our trip, and I’m not really surprised: it grows well in Iceland, it preserves well, and, quite frankly, it can be pretty yummy. I’ll have to try it on my waffles at home at some point. As we sat there looking at the window, we were reminded of two things about Iceland… how beautiful it is (Fjalladýrð is just east of a really nice range of volcanic mountains), and how fickle it is. In our five minutes of waffle-eating, the weather changed from sunny and pleasant to “driving sleet”. 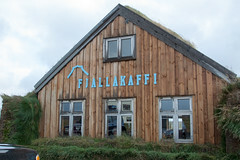 We’ll have to try Fjalladýrð again… rumor is that the lamb dinner is phenomenal. 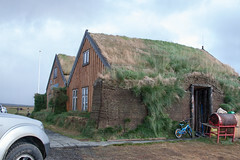 And it’s about as offbeat (and off-the-beaten-path) as places get, even by Iceland’s quirky standards. Our second to last full day in London involved a trip out to Crystal Palace Park to gaze upon what little remains of the old Victorian era Crystal Palace. Built in Hyde Park for the Great Exhibition of 1851, and later moved to Southeast London on top of a hill, the palace itself burnt down in the 1930s, but bits and pieces of the former wonder still remain: the foundation, the main staircase, some sphinxes, and some curiously outdated but historical dinosaurs. After a nice walk seeing the park, being a Sunday, we decided it would be nice to duck into a pub and score some classic pub food, wandering over to Westow House on the west edge of the park.